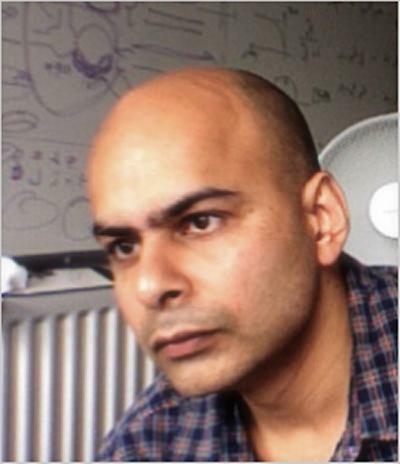 Dr Srinandan Dasmahapatra is part of the Institute for Life Sciences at the University of Southampton. Evolution of regulatory circuits with duplicated genes. Stochastic dynamics of gene networks. Classification of plant electrophysiological responses. Algebraic geometry and regulatory dynamics. Mathematical models of circadian rhythms. Xiao, L., Hu, B., Croitoru, M., Lewis, P., & Dasmahapatra, S. (2010). A knowledgeable security model for distributed health information systems. Computers and Security, 29(3), 331-349. Hu, B., Dasmahapatra, S., & Lewis, P. (Accepted/In press). Semantic Metrics. International Journal of Metadata, semantics and Ontologies. Robertson, D., Giunchiglia, F., van Harmelen, F., Marchese, M., Sabou, M., Schorlemmer, M., ... Loizou, A. (Accepted/In press). Open Knowledge: coordinating knowledge sharing through peer-to-peer interaction. Languages, Methodologies and Development Tools for Multi-Agent Systems. First International Workshop, LADS 2007. Revised Selected and Invited Papers, 1-18. Hu, B., Dasmahapatra, S., Dupplaw, D., Lewis, P., Shadbolt, N., O'Hara, K. (Ed. ), & Brewster, C. (Ed.) (2007). Reflections on a Medical Ontology. International Journal of Human-Computer Studies, 65(7), 569-582. Dasmahapatra, S., & O'Hara, K. (2006). Interpretations of Ontologies for Breast Cancer. tripleC, 4(2), 293-303. Dasmahapatra, S., Werner, J., & Zauner, K-P. (2006). Noise as a Computational Resource. International Journal of Unconventional Computing, Volume(4), 305-319. Alani, H., Dasmahapatra, S., O'Hara, K., & Shadbolt, N. (2003). Identifying Communities of Practice through Ontology Network Analysis. IEEE Intelligent Systems, 18(2), 18-25. Alcaraz, F. C., Dasmahapatra, S., & Rittenberg, V. (1998). Stochastic models with boundaries and quadratic algebras. Physica A: Statistical Mechanics and its Applications, 257, 1-9. Dasmahapatra, S., & Foda, O. (1998). Strings, paths, and standard tableaux. International Journal of Modern Physics A, 13, 501. Dasmahapatra, S. (1997). On the combinatorics of row and corner transfer matrices of the An-1(1) restricted face models. International Journal of Modern Physics A, 12, 3551-3586. Dasmahapatra, S., Kedem, R., McCoy, B., & Melzer, E. (1994). Virasoro Characters from Bethe Equations for the Critical Ferromagnetic Three-State Potts Model. Journal of Statistical Physics, 74, 239-274. Dasmahapatra, S., Kedem, R., Klassen, T., McCoy, B. M., & Melzer, E. (1993). Quasi-Particles, Conformal Field Theory, and $q$-Series. International Journal of Modern Physics B, 7, 3617-3648. Dasmahapatra, S., Kedem, R., & McCoy, B. M. (1993). Spectrum and completeness of the 3 state superintegrable chiral Potts model. Nuclear Physics B, 396, 506-540. Dasmahapatra, S. (1993). String Hypothesis and Characters of Coset CFTs. ICTP Preprint IC/93-91, hep-th/9305024..
Albertini, G., Dasmahapatra, S., & McCoy, B. M. (1992). Spectrum and Completeness of the Integrable 3-state Potts Model: A Finite Size Study. International Journal of Modern Physics A, 7(Supple), 1-53. Albertini, G., Dasmahapatra, S., & McCoy, B. M. (1992). Spectrum Doubling and the Extended Brillouin Zone Scheme in the Excitations of the 3-state Potts Spin Chain. Physics Letters A, 170, 397-403. Dasmahapatra, S. (1990). The XY-model on a Pseudo-sphere: A Renormalization Group Analysis. Modern Physics Letters B [Condensed Matter Physics; Statistical Physics and Applied Physics], 4(20), 1273-1279. Dasmahapatra, S. (2012). Noise in regulatory networks. In A. Ma'ayan, & B. MacArthur (Eds. ), New Frontiers of Network Analysis in Systems Biology (pp. 31-58). New York, US: Springer. Albertini, G., Dasmahapatra, S., & McCoy, B. M. (1993). Exact Spectrum of the Integrable 3-state Potts Chain. In J-M. Maillard (Ed. ), Yang-Baxter equations in Paris World Scientific Publishing Company. Iakovliev, A., Dasmahapatra, S., & Bhaskar, A. (Accepted/In press). Stability of mitotic spindle using computational mechanics. Paper presented at 2019 9th International Conference on Bioscience, Biochemistry and Bioinformatics, Singapore, Singapore. Braichenko, S., Bhaskar, A., & Dasmahapatra, S. (2018). The spatial arrangements of stochastic Ca2+ signals triggered by IP3 release. Poster session presented at 3rd European Calcium Channel Conference 2018, Alpbach, Austria. Braichenko, S., Dasmahapatra, S., & Bhaskar, A. (2017). Calcium release dynamics in clusters of IP3 channels. 79. Poster session presented at EMBO workshop, LabEx INFORM, Cargese, France. Dasmahapatra, S. (2011). Oscillatory dynamics in a double activator motif. Paper presented at International Workshop on Computational Systems Biology (WCSB 2011), . Pakka, V., Prugel-Bennett, A., & Dasmahapatra, S. (2009). Correlated fluctuations probe dynamics of transcriptional regulation. Poster session presented at Sixth International Workshop on Computational Systems Biology, WCSB 2009, Denmark. Xiao, L., Vicente, J., Sáez, C., Peet, A., Gibb, A., Lewis, P., ... Dupplaw, D. D. (2008). A Security Model and its Application to a Distributed Decision Support System for Healthcare. 578-585. Paper presented at The Third International Conference on Availability, Reliability and Security (ARES'08), Spain. Xiao, L., Lewis, P., & Dasmahapatra, S. (2008). Secure Interaction Models for the HealthAgents System. 167-180. Paper presented at The 27th International Conference on Computer Safety, Reliability and Security (SAFECOMP'08), United Kingdom. Croitoru, M., Hu, B., Dasmahapatra, S., Lewis, P., Dupplaw, D., & Xiao, L. (2007). A Conceptual Graph Description of Medical data for Brain Tumour Classification. 140-153. Paper presented at Proc. 15th International Conference on Conceptual Structures: Knowledge Architectures for Smart Applications, United Kingdom. Xiao, L., Robertson, D., Croitoru, M., Lewis, P., Dashmapatra, S., Dupplaw, D., & Hu, B. (2007). Adaptive Agent Model: an Agent Interaction and Computation Model. 153-158. Paper presented at The 31st IEEE Annual International Computer Software and Applications Conference (COMPSAC'07), China. Xiao, L., Peet, A., Lewis, P., Dashmapatra, S., Sáez, C., Croitoru, M., ... Lluch i Ariet, M. (2007). An Adaptive Security Model for Multi-agent Systems and Application to a Clinical Trials Environment. 261-266. Paper presented at The 31st IEEE Annual International Computer Software and Applications Conference (COMPSAC'07), China. Croitoru, M., Hu, B., Dasmahapatra, S., Lewis, P., Dupplaw, D., Gibb, A., ... Mier, M. (2007). Conceptual Graphs Based Information Retrieval in HealthAgents. 618-623. Paper presented at CBMS'07: 20th IEEE International Symposium on Computer Based Medical Systems, Slovenia. Hu, B., Dasmahapatra, S., Robertson, D., & Lewis, P. (2007). Decentralised Clinical Guidelines Modelling with Lightweight Coordination Calculus. The 2nd International Symposium on Languages in Biology and Medicine (LBM) 2007, Singapore. Hu, B., Croitoru, M., Dasmahapatra, S., Lewis, P., & Shadbolt, N. (2007). Indexing Ontologies with Semantics-enhanced Keywords. The Fourth International Conference on Knowledge Capture, Canada. Dupplaw, D., Croitoru, M., Loizou, A., Dasmahapatra, S., Lewis, P., Tuffield, M., & Xiao, L. (2007). Multimedia Markup Tools for OpenKnowledge. Poster session presented at 1st Workshop on Multimedia Annotation and Retrieval enabled by Shared Ontologies, Italy. Kalfoglou, Y., Dasmahapatra, S., Dupplaw, D., Hu, B., Lewis, P., & Shadbolt, N. (2006). Living with the Semantic Gap: Experiences and remedies in the context of medical imaging. Paper presented at 1st International Conference on Semantics and Digital Media Technologies, Greece. Arus, C., Celda, B., Dasmahapatra, S., Dupplaw, D., Gonzalez-Velez, H., van Huffel, S., ... Robles, M. (2006). On the Design of a Web-Based decision Support System for Brain Tumour Diagnosis using Distributed Agents. 208-211. Paper presented at 2006 IEEE/WIC/ACM International Conference on Web Intelligence & Intelligent Agent Technology (WI-IAT), . Loizou, A., & Dasmahapatra, S. (2006). Recommender Systems for the Semantic Web. Paper presented at ECAI 2006 Recommender Systems Workshop, Italy. Tuffield, M. M., Loizou, A., Dupplaw, D., Dasmahapatra, S., Lewis, P. H., Millard, D. E., & Shadbolt, N. R. (2006). The Semantic Logger: Supporting Service Building from Personal Context. Poster session presented at Capture, Archival and Retrieval of Personal Experiences (CARPE) Workshop at ACM Multimedia, . Dutta, P. S., Dasmahapatra, S., Gunn, S. R., Jennings, N. R., & Moreau, L. (2004). Cooperative Information Sharing to Improve Distributed Learning. 18-23. Paper presented at The AAMAS 2004 workshop on Learning and Evolution in Agent-Based Systems, . Brewster, C., Alani, H., Dasmahapatra, S., & Wilks, Y. (2004). Data Driven Ontology Evaluation. Paper presented at International Conference on Language Resources and Evaluation, Portugal. Kalfoglou, Y., Dasmahapatra, S., & Chen-Burger, J. (2004). FCA in Knowledge Technologies: Experiences and Opportunities. 252-260. Paper presented at 2nd International Conference on Formal Concept Analysis (ICFCA'04), Australia. Shadbolt, N., Lewis, P., Dasmahapatra, S., Dupplaw, D., Hu, B., & Lewis, H. (2004). MIAKT: Combining Grid and Web Services for Collaborative Medical Decision Making. AHM2004 UK eScience All Hands Meeting, United Kingdom. Dupplaw, D., Dasmahapatra, S., Hu, B., Lewis, P., Shadbolt, N., Handshuh, S. (Ed. ), & Declerck, T. (Ed.) (2004). Multimedia Distributed Knowledge Management in MIAKT. 81-90. Knowledge Markup and Semantic Annotation, 3rd International Semantic Web Conference, Japan. Dasmahapatra, S., Dupplaw, D., Hu, B., Lewis, H., Lewis, P., Poissonnier, M., & Shadbolt, N. (2004). Ontology-based Decision Support for Multi- Disciplinary Management of Breast Cancer.. Paper presented at INTERNATIONAL WORKSHOP ON DIGITAL MAMMOGRAPHY 2004, United States. Hu, B., Dasmahapatra, S., Shadbolt, N., Calvanese, D. (Ed. ), De Giacomo, G. (Ed. ), & Franconi, E. (Ed.) (2003). From Lexicon To Mammographic Ontology: Experiences and Lessons. 229-233. International Workshop of Description Logics-DL'03, . Hu, B., Dasmahapatra, S., Lewis, P., & Shadbolt, N. (2003). Ontology-based Medical Image Annotation with Description Logics. 77-82. The 15th IEEE International Conference on Tools with Artificial Intelligence, United States. Alani, H., Dasmahapatra, S., Gibbins, N., Glaser, H., Harris, S., Kalfoglou, Y., ... Shadbolt, N. (2002). Managing Reference: Ensuring Referential Integrity of Ontologies for the Semantic Web. 317-334. Paper presented at 13th International Conference on Knowledge Engineering and Knowledge Management (EKAW'02), Spain. Dasmahapatra, S., & Cox, S. (2000). Meta-models for Confidence Estimation in Speech Recognition. Proceedings International Conference on Acoustics Speech and Signal Processing, . Dasmahapatra, S. (1994). Statistics of Quasi-particles and Characters of CFTs. In 1993 summer school in high energy physics and cosmology; Trieste (Italy); 14 Jun - 30 Jul 1993 (pp. 427-437). World Scientific Publishing Company.